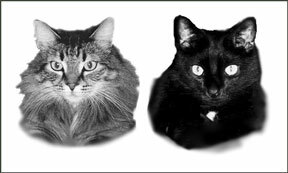 This portrait features a domestic medium haired brown tabby cat called Buster and a short haired black cat called Charlie. 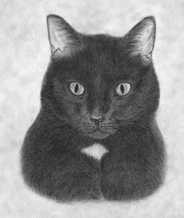 I enhanced the image to be able to see the pencil outline. 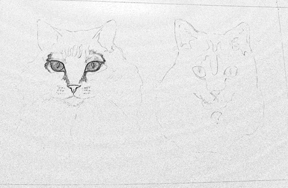 It is a very rough sketch of the portrait. 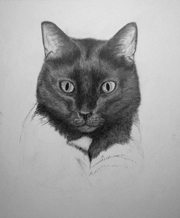 Buster's eyes are complete. 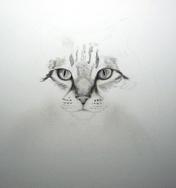 I've now started to work the fur around the eyes/face towards the nose. More tedious layering of hair mostly using a 2b pencil. Buster is coming to life! 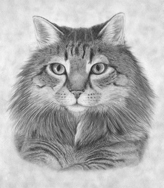 I will be starting the long fur of the neck soon. A bit more work left on the legs and chest, then and I will start to work on Charlie. 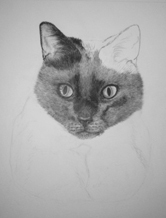 I've completed the details of Buster's legs and chest and added a subtle background. 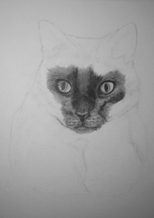 I've begun working Charlie's eyes and facial fur. 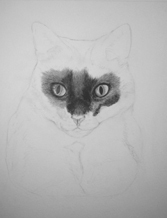 More and more fur is added. 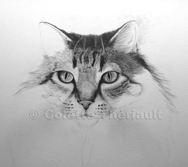 Once the base layer of fur is added, I will define the areas of the face which include darker and lighter areas. 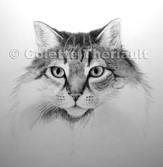 The cat's head is now complete so I can now work on the rest of the body. 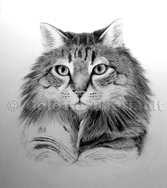 Charlie's fur is darkened and the shoulders and background are completed. 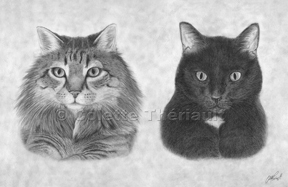 This is what the completed portrait of Buster and Charlie looks like.